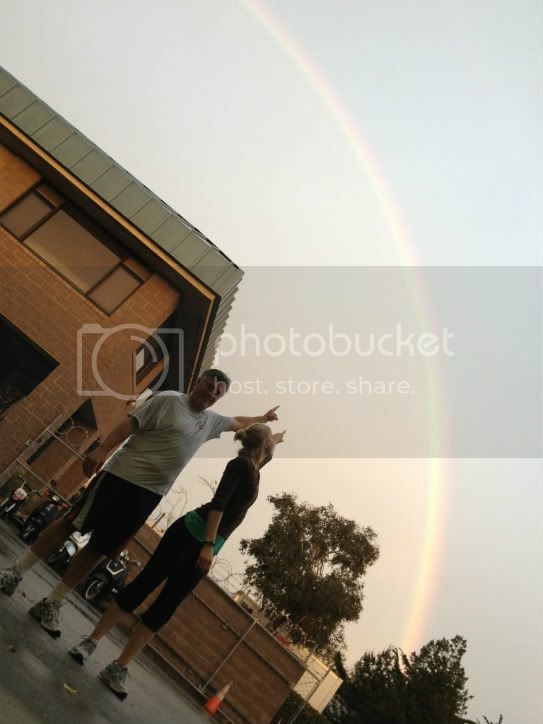 Cool little rainbow shot with Jeff and Rachel. The importance of a good night sleep cannot be overstated. A good technique to try if you have trouble sleeping involves diaphragmatic breathing, also known as belly breathing or abdominal breathing. It's extremely simple and extremely effective. All you have to do is breathe through your stomach with a big distended abdominal inhalation, followed by a long exhalation ending with a deflated/contracted belly and no air left to breathe out. You want to keep the breath right in the abdominal region and not let it creep up to your chest. An easy test to make sure you're doing it right is to put your hand on your stomach, push it away as far as you can with an inhalation and just relax it as your stomach deflates during the exhalation. This technique is not an overnight fix for insomnia (although it can help immediately). There is somewhat of a skill involved here that has to do with the breathing technique but also your attention. Keeping your attention on the breath, not letting your mind wonder has similar relaxation qualities to abdominal breathing. Together they can be as effective as any sleep aid. This may seem like big claims with no real science behind it but there are actual physiological mechanisms behind this phenomenon that legitimize the technique. This form of breathing increases parasympathetic activity, remember that one? Increased parasympathetic tone decreases the heart rate, lowers blood pressure and relaxes skeletal muscle, just to name a few. It may be obvious but that is what you want when you are trying to fall asleep, parasympathetic activity in the form of low blood pressure, slowed heart rate and relaxed muscles. Abdominal breathing is a relaxation technique that can be extremely effective if approached with an open mind and patience. Something as important as sleep is worth the try. Interested in Improving Performance? Repairing Dysfunction? Preventing Injury? Treating Pain? Check out the Trigger Point Therapy Certification happening this Saturday! Sign up is linked to the right of page.